Empress Ki tells the story of Ki Sung Nyang (Ha Ji Won) who rises from nothing to marry Emperor Ta Hwan (Ji Chang Wook) and become Empress of the Yuan Empire. She also gets involved in a love triangle with the Emperor and King Wang Yu of Goryeo (Joo Jin Mo). Empress Ki has been on my watch list forever! It’s one of those dramas that I had only heard positive reviews for, but clocking in at 51 episodes, I was always hesitant to start it. I mean, I could watch three dramas in that time span! And I love a good sageuk, but they can be hit or miss with me. I happened to take quite a liking to the Goryeo period not long before starting this drama, and that’s really what gave me the final push to watch it. I must say, there really needs to be more dramas set during the Goryeo period! 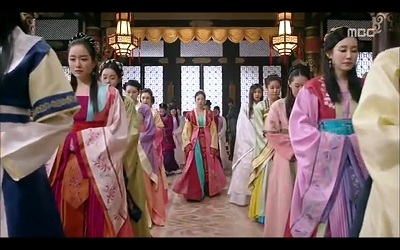 Now I really enjoy the costumes from the Joseon period, but I am in love with the Goryeo attire. They’re just more fun to me. There’s such a wide array of colors and styles. I love what royalty wears, what the soldiers wear, and what the common man wears. I also really love that the guys wear their hair down a lot more. I love the long, pretty hair! And the guys and girls both wear more jewelry which is something I really like. 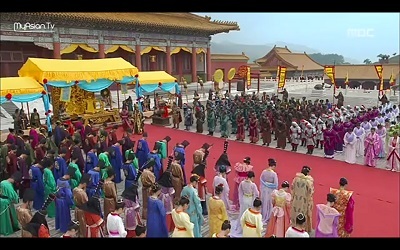 Empress Ki is beautifully filmed and I was drooling all over the gorgeous cinematography as well the constant parade of beautiful costumes worn by practically everyone. 51 episodes in Goryeo really is a nice place to be. Sung Nyang is about as strong as they come. After a difficult childhood, she has pretended to be a man for most of her life. Her skills are unparalleled and known by many. She is also as loyal as can be, so when she bonds with the Wang Yu, she will always be true to him. 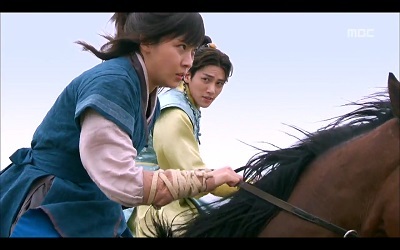 And because of his request, she does her best to protect the future Emperor of Yuan, Ta Hwan. Her character goes through so many trials, and she is forced to harden herself as the drama goes on. 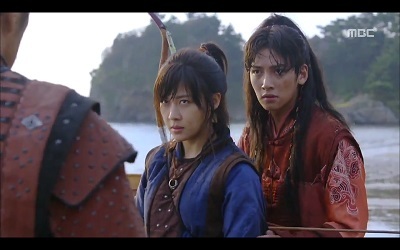 Ha Ji Won displayed a wonderful acting range going from a more loose, fun Sung Nyang to the absolutely serious Sung Nyang out for revenge for her fallen loved ones. Emperor Ta Hwan was so much fun! In the beginning, Ta Hwan is a spoiled and cowardly man. He was like a spoiled child who was out of touch with reality. But his fears for his life were genuine. People who were supposed to be protecting him were trying to kill him. He didn’t know who to trust. I got quite a kick out of his character. He was humorous and at the same time I felt bad for him. He goes through a slow and painful transformation as he learns to use his power and truly be a ruler. 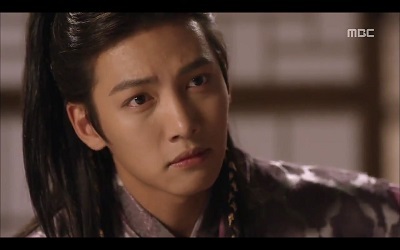 Ji Chang Wook was fabulous at portraying both the humorous and regal sides to this character. 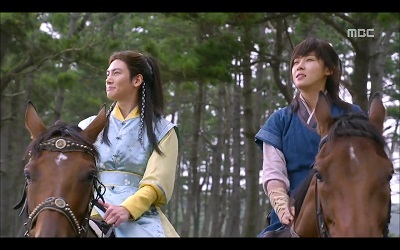 It’s thanks to Ji Chang Wook’s performance that Ta Hwan was so likable despite having so many flaws. 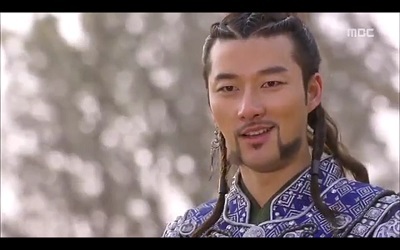 King Wang Yu is a righteous man who always has the best interests for his people. He quickly takes a liking to Sung Nyang, but soon gets caught in the middle of the politics going on in Yuan. 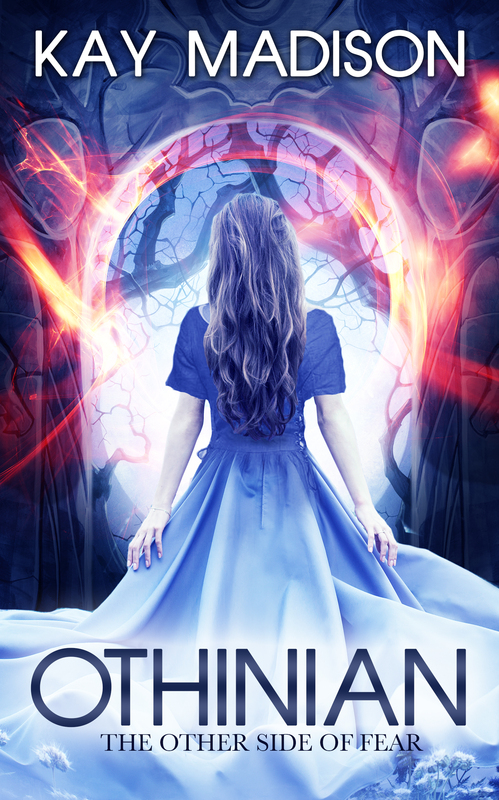 By having Sung Nyang be the Emperor’s protector, he unwittingly sets up a future of heartache. His character becomes more pained as the drama continues. 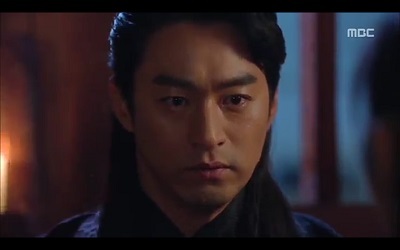 Joo Jin Mo brings forth the intensity that a character like this requires. My only real issue with the drama stems from the relationship with Wang Yu and Sung Nyang. I felt that they needed more time in the beginning of the drama to establish their relationship. The drama hints a lot at their unwavering love and loyalty towards each other, but it really wasn’t adequately established. And then they spend the bulk of the drama apart. I enjoyed them when they were together, but it just wasn’t enough to convince me of their epic love. Sung Nyang spends lots of time with Ta Hwan though. In the beginning it is of a more humorous and fun nature. I loved their interactions in those early episodes. She goes through a period where she hates him, and then she finally begins to soften towards him and also sees that she can use him to help her in her revenge quest. Ta Hwan initially likes her, but in a very possessive sort of way. He would stop at nothing to make her his. But when she finally softens towards him and shows him that he really can be a powerful ruler, he begins to truly love her for who she is. And her faith in him is what causes him to want to overcome his fear and become the Emperor he was meant to be. 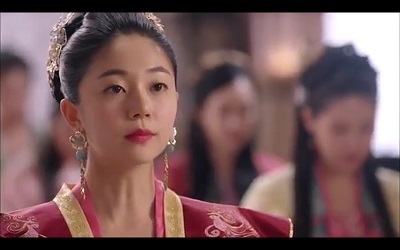 The Empress Tanasili played by Baek Jin Hee completely nailed her role. How I disliked her! But she was always fun to watch. She was evil and completely oblivious to the hypocrisy of her blaming everyone else for her misdeeds. I really got a kick out of her interactions with her main servant Lady Seo (Seo Yi Sook). This lady was ready to do literally anything the Empress said. The delight on her face when she was plotting with the Empress was priceless. Baek Ahn (Kim Young Ho) and Tal Tal (Jin Yi Han) were a surprisingly fun pair. They start out as the first bad guys because of their attempts to murder Ta Hwan. But they finally decide to go against the Regent and pledge their support to that Hwan. They are forced to constantly play both sides as they try to navigate what is best for the Yuan Empire. They end up helping Sung Nyang in ways I would have never dreamed of. 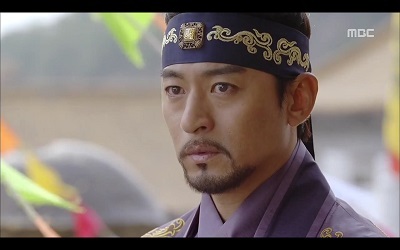 Baek Ahn is your classic army general who’s loyalty to his country never wavers. Tal Tal was a character that I became more intrigued with as the drama progressed. Tal Tal always knew what was going on with everyone and was extremely wise. He doesn’t show a lot of emotion, but there is so much going on in his head. I found him so fascinating. And he just looked really cool in army gear and perfect hair. This is a complete side interest of mine, but there is a portion later on in the drama that really got my imagination going. Tal Tal ends up secretly training Sung Nyang so that she can be their clans representative to be a consort to the Emperor. I loved their training sessions and exchanges of information. The Empress Dowager (Kim Seo Hyung) was an interesting character. For the first two-thirds of the drama, she is one of the few people who supports Ta Hwan. She is integral in helping him and Sung Nyang battle the Regent. But she makes a swift turn in the latter third becoming a villain in her own right. I must say that Joon Gook Hwan is excellent at playing villainous characters, and this has to be one of my favorites I’ve seen him do. The Regent is driven by his thirst for power and will do anything to get what he wants. 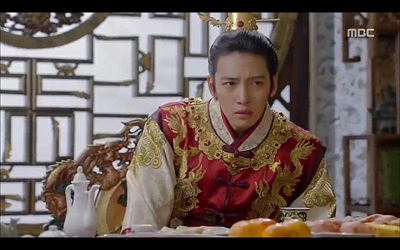 He prays on Ta Hwan’s weakness and is easily able to rule Yuan in his stead. He is a ruthless but lively character who has one of the most awesome evil laughs. Dang Ke Si (Kim Jung Hyun) has a bad history with Sung Nyang in that he is the one who killed her mother. He is the perfect extenstion of his father, the Regent, being the one who executes many of the plans for power. His brother (Cha Do Jin) is Dang Ke Si’s right hand man. He doesn’t do much on his own accord and is probably the least interesting of the villain characters, but he is a nice compliment to our first family of evil. 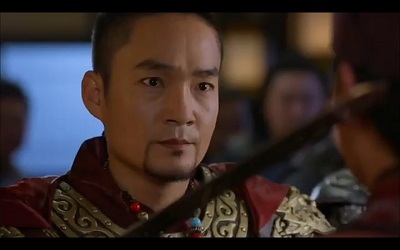 Wang Yu then has his band of loyal servants and bodyguards who are there for him from start to finish. Each one was unique with his own quirks and talents. This group goes through a lot for our King and Sung Nyang. They are the kind of friends anyone would want to have. 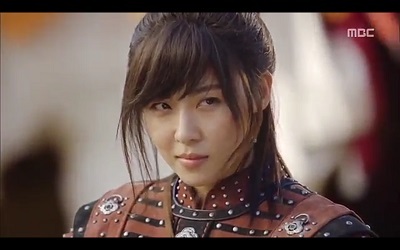 Empress Ki maintained a wonderful pace throughout the drama. Even though the pacing was always good, it also had several layers of well done story arcs that ramped up the intensity several times. It was very well structured. It was interesting from start to finish, and I was never bored. That says a lot considering it is 51 episodes. Empress Ki created a rich world populated with fun and interesting characters. The villains were always entertaining to watch. They were the kind of villains you love to hate. We had humorous and loyal supporting characters. And we had the epic journey of our leading lady on her rise power that was aided by her relationships by the King of Goryeo and the Emperor of Yuan. I wouldn’t hesitate in recommending Empress Ki. Many people told me not to be scared off by the 51 episodes, and I will pass along that recommendation to you. It truly did fly by, and I was sad to see this rich world come to an end. I really did love every minute of it. Empress Ki really is epic, and as far as sageuks go, it is one of the best. This entry was posted in Reviews and tagged Baek Jin Hee, Empress Ki, Ha Ji Won, Ji Chang Wook, Jin Yi Han, Joo Jin Mo, kdrama, Kim Young Ho, Korean Drama, sageuk. Bookmark the permalink. I loved it too! I probably like sageuks more than you because I enjoy the history, but this was especially good. When I watch a sageuk, I like to read a little about the real history. Empress Ki is very far from what is known about the period and the rulers. One thing I found interesting is that there really was an Emperor Ta Hwan who had the same kind of problems with court politics, but he was only eight years old when he went to Goryeo. 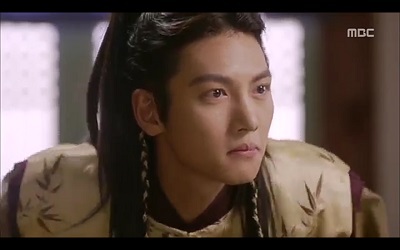 Ji Chang Wook’s portrayal is right on because he really was a spoiled child in fear for his life. Such an amazing drama! I actually love sageuks, but they have to be very low on the politics, which many aren’t. Nothing bores me more than political scheming. 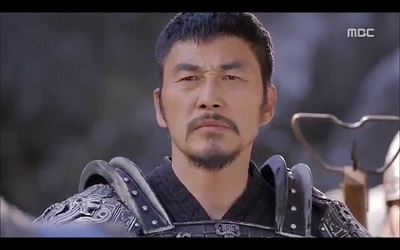 Empress Ki was great because it did have political scheming throughout, but it did so well at keeping those scenes brief, informative, and entertaining because of the wonderful villain characters. It was pretty much a perfect sageuk for me. You mentioned a couple months ago you were enjoying Dong Yi. Did you ever finish it? I did finish Dong Yi and loved it. Thanks so much for the recommendation. I also tend to read the history after I watch the drama. The dramas I love most are the ones that don’t stick too close to the history. Empress Ki could have had one of those wonderful child actors play the young Ta Hwan, but it wouldn’t have been nearly as good as having Ji Chang Wook play the character as a grown man acting like a spoiled child. 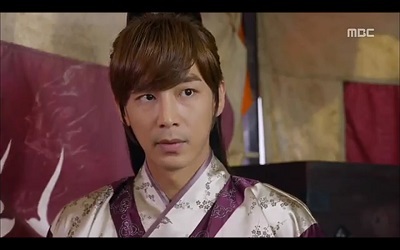 He did manage to look much younger than his real age, but old enough to sell the relationship with Ha Ji Won. I’m glad you enjoyed it! Yeah, I’m so glad they didn’t use any child actors in this one. Ji Chang Wook sold the role. I had (and still have) so many issues with this drama. It was a masterpiece up to episode 22. The writers’ brilliance was there and then…fan wars and accuracy maniacs took over. The acting and the directing (plus cinematography) just couldn’t make up for what was happening behind the scenes. The clever shenanigans were replaced by toooo many plots inside the harem, JJM’s role was cut short (leaving him angry and bitter. I can’t blame him despite the fact that his complaints were probably the main reason for losing the leading role in next month’s 50-ep. Tyrant), the “fangirlism” became online bulling (on a personal level) and, in the end, the writers hated each and every character to death (because we all know the big finale, right?). PS I couldn’t care less about History (I’m not Chinese, so I haven’t a clue anyway) but the overture had nothing to do with the plot we actually watched. I don’t know whether it was MBC’s choice (because the CEOs had the Chinese market in mind) or was the writers’ decision but no one denies the obvious: Empress Ki was a two-dramas combo. It sounds like it was a good thing that I didn’t know what was going on behind the scenes or with the fandom during its airing. I was able to marathon it in ignorant bliss. I never would have guessed that the writers hated the characters they were using to tell their story. I’m not Chinese or Korean, but I enjoy learning a little bit of history about all kinds of different countries. It is especially interesting to see how simple facts about a different time and place can be turned into exciting stories. Yikes, sounds like there was more drama going on behind the scenes than in the actual drama! I too marathoned this in ignorant bliss, and I’m glad I did. I definitely agree that the first half of the drama was better than the second, but I still thoroughly enjoyed the second half. But the one thing I did mention in my review that I felt wasn’t executed well was the relationship between Wang Yu and Sung Nyang. But I felt it wasn’t even adequately established in the beginning of the drama, and then they were apart for so much of the rest. I was pretty much always rooting for Ta Hwan. His character was just so much more interesting. 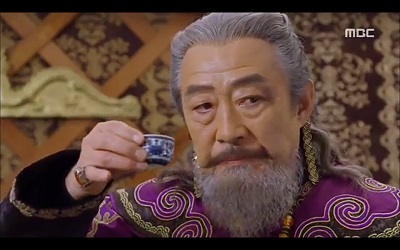 My biggest peeve with this show is that the writers really did Wang Yu dirty. Such a righteous, big-hearted character didn’t deserve what he got and there was no vindication for him. In fact the heroes lost so much more than they gained. It was a great watch but it left a bad taste in that respect. It left me questioning if the writers were depressed because the feelings of the creator do leak out in their work. The body count just got ridiculous and things were unfair or made no sense near the end. Togon just seemed to get what he wanted without it being earned and Nyang became his mommy and friend-zoned her King who would die for her. It was messed up. Is there no justice in the world? The REAL problem in this show was the corrupt Yuan Empire exploiting all its provinces. I wish it would just collapse and everyone would be free of it. It was what caused all the heroes troubles in the first place but it was never truly resolved to me, like the slave trade and opulent, wasteful living of Yuan royalty. The love triangle just…didn’t work. Togon, while he had potential, could not compare to Wang Yu in terms of substance. The moral of this triangle also sends me a bad message: the dysfunctional, obsessive guy got the girl while the righteous, brave man lost everything including his child? As a woman, I do not agree with that. A man should have a spine and goals of their own, not constantly look to me for validation. That is what Nyang did to Togon. She did not strengthen him, she crippled him even more by enabling his dependence on her and she in turn became weaker and out of character herself. Togon should have taken it upon himself to learn to read, make more plans of his own, start to pay attention to the needs of his people, root out corruption, and use that blasted office to run his country. No, Nyang had to hold his hand the whole time and he kept hating Wang Yu who could have been a great ally because of his childish jealousy. A more viable and even formidable romantic rival would have been Tal Tal. Passionate Wang Yu was all heart and reserved Tal Tal is all brain. Both are quite attractive attributes and both were righteous men. THAT would have been a heart-splitting love triangle if written right and not overstated. An alternative plot would be for Nyang to try the royal politics for a while, see that it doesn’t work because the corruption is endless and rejoin Wang Yu and wage economic war on Yuan while forging allies. Isn’t that why Wang Yu spared Yon Feisu the Turk (who doesn’t look Turkish at all but eh)? They never built that alliance like they hoped. Feisu was relegated to an additional love interest instead of a pillar of support of Korea. Whatever happened to them taking the SILK ROAD???? Tal Tal and Bayan were also great candidates for allies because they never truly took sides unless it worked for their sense of justice. Economic war would make sense since Yuan, despite its pomp, is growing weak from its own corruption. Nyang would have become familiar with its weak spots during her time there and know how to knock its pillars out from under it. The commoners were suffering and they could have also been won over if Togon became a people’s emperor. With the Eagle House element, the economic war could have overlapped with some black market finagling. I liked watching this show the first time but this bad taste is enough to make it my only time. I do want to watch other titles these actors show up in though. THEY were great! Yes, Wang Yu definitely didn’t come out so good in the drama. It was tough seeing how much he struggled. As for the love triangle, I found I liked the Sung Nyang and Togon pairing more mostly because they were much more entertaining. Of course in real life, I think anyone would choose Wang Yu over Togon. I certainly would. But in a drama, I tend to go for the more conflicted not so lovable types, which definitely fits Togon. I agree that it would have been interesting to see a larger scale economic war between the two empires. I would have also liked to see Feisu have a larger presence throughout the drama. Although the drama wasn’t perfect, it definitely kept me thoroughly entertained, so I mostly have love for it. i bet if they had written the drama the exact way u wnt it would have ended up a snooze fest . Thank you so much 🙂 Yes, definitely some great characters in this drama! Love Togon, Nyang, and Tal Tal too. Such a great drama! I really loved watching these movies too.. But shouldn’t there be a means of downloading it to my Android device? It really was a great drama 🙂 There’s bound to be someone that has it available for download, but I haven’t ever come across it though. Sweetheart, I couldn’t av said it any better! Empress ki was just mwaaa…*infinite. From beginning to end I was kept glued to my seat like I was compelled to be there! And lyk u, I kept a special place for Tal Tal in my heart. Dude was such a character! I wish to see him in more dramas. I just cldnt gt over dat series. Ts one of d best kdramas av seen. Ts a 10/10 for me. Am very glad there’s this platform wr I cld relieve my post withdraw syndrome cz twas go kill me…oooo! Hahahaha Tal Tal, definitely. I actually remember promising myself dat shd he gt killed in d drama, I wld walk out from d drama with him😁. Good th d writer never let m. He didn’t die till d last mins in d drama, wr lyk nyang, I just shed tears n endured to d end. There’s sm funny line though that made me laf so much, cldnt forget to point it out. dat tym nyang as consort was nt at per with Tal Tal n she advised her surbodinates to be aware of him coz ‘he cld read d heart of a stone Buddha!’ Hahahaha cldnt stop laughing.